The first thing I noticed when I walked into Eren’s Grill was the neatness and precision of the refrigerator case. Platters of perfectly aligned kebabs await the grill. Bowls of bright-red-hued eggplant-tomato salad and pale, fluffy humus. Glistening rows of dark-green stuffed grape leaves. 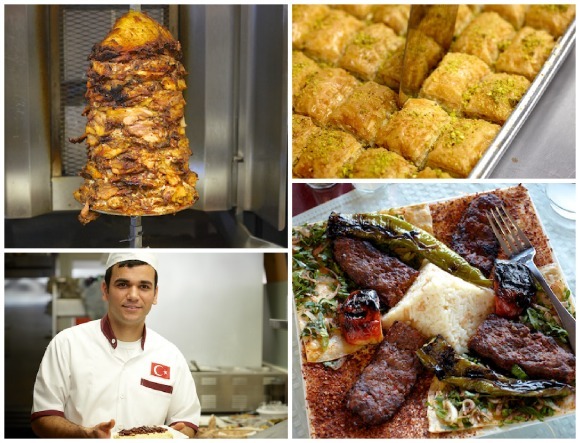 Then Eren, a young man wearing chef’s white’s embellished with the Turkish flag, stepped out from the open kitchen and proudly started telling me about his fresh and homemade food. 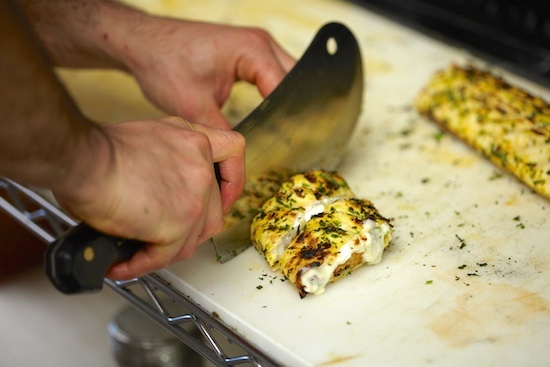 Fairfield’s new and only Turkish restaurant is a small joint in a strip mall. With just a few tables, it does a lot of take-out and catering. Whether eat-in or take-out, it’s a welcome addition to the Tunxis Hill section of Fairfield, a neighborhood that could use more good food. And the food here is good: fresh and full of flavor. 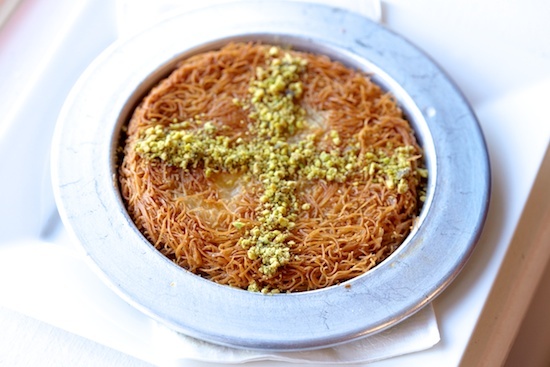 Ottoman cuisine has a long and noble history, and Eren – who was head chef of the Athens’ Tike, an international group of Turkish restaurants in places like London, Cyprus and Kiev -- for 8 years -- is proud to put his signature on it. “I want to play a little,” he says. And play he does. Have you ever had warm humus? 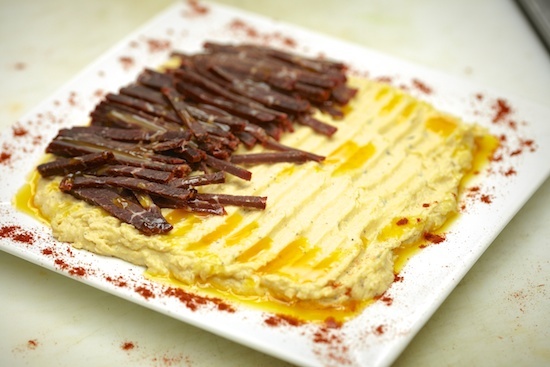 Chef Eren’s creation is a warm, fluffy, saffron-hued humus, lemony, with an interesting low note (turmeric, we wondered? ), topped with warm, julienned beef pastrami that leaves luscious traces of orange-hued oil on the surface of the humus. Chef Eren is from Adana, Turkey. It’s the country’s fourth largest city, a major agricultural (and food processing) area in the south near where the Seyhan River meets the Mediterranean Sea. 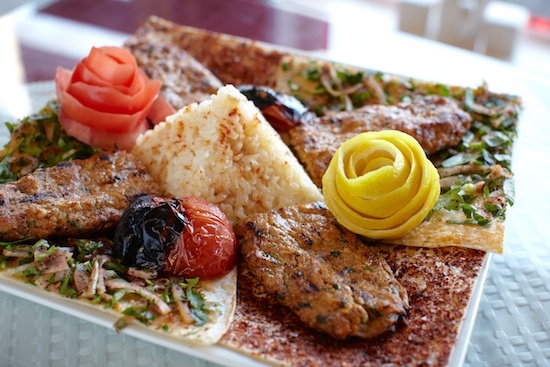 Foodie alert: this is the home of the Adana kebab. Eren’s Adana kebab is made of hand-minced lamb, mixed with red bell pepper and spices he prefers to keep secret. As in keeping with the restaurant’s name, Eren grills the meat until it is tender, moist and deeply flavorful. There’s a chicken version, tavuk Adana, and the chef says the most popular dish on the menu is the chicken Adana in a crispy wrap. As one who has never understood the idea of eating a cold wet wrap, I applaud Eren’s use of the grill. I lived in Antalya, Turkey for a year when I was young, and it’s when I first became conscious of food. To me, cacik, the classic cucumber sauce, epitomizes Turkish food. I grew up making it at home, but Eren’s cacik is worth leaving home for. He makes the yogurt himself so it’s super fresh. He seasons it with just the right touch of garlic, mint and dill. Tangy, fresh, cooling, with soft-crunchy slices of cucumber, this cacik will make you want to drizzle it on everything. More decadent is the haydari, a thickened yogurt made with feta cheese, garlic and mint. Chef Eren says it is often served with meat. Speaking of meat, you can grab a kebab wrapped in pita bread and garden salad, or order it as an entree with rice and tomato and peppers. And yes, there’s gyros and falafels, but it might take me a while to sample the old familiars when my eye is drawn to grilled marinated lamb chops and lamb meatballs. 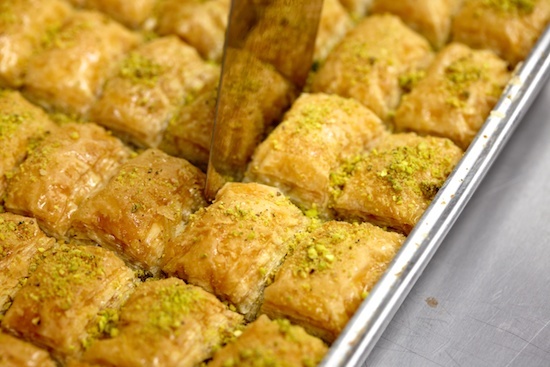 Lemon is an important flavoring in Turkish food (Adana is a major citrus growing area). 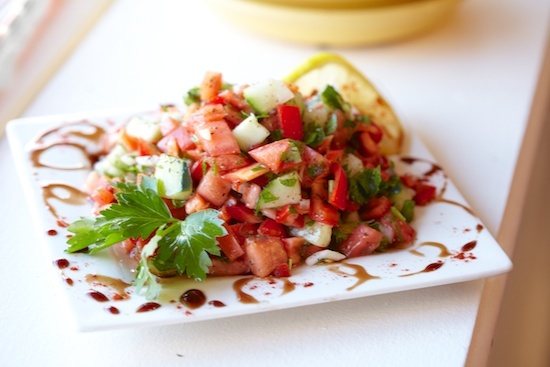 Most of the salads at Eren’s Grill, like the Shepherd Salad of chopped tomatoes, cucumbers, onions and parsley, are dressed in lemon-olive oil dressing. The Spoon Salad has the same vegetables but is dressed in pomegranate juice and olive oil dressing, which adds a hint of the fruit’s distinctive sweet and tannic flavor. Of the desserts, I only tried the rice pudding, which Chef Eren is proud of. “Rice pudding is everywhere,” he says, “But this one is different.” Topped with a stick of cinnamon, the soft rice is bound in thickened milk steeped in spices. The flavors are gentle. Next time, I might get adventurous and try the Kunefe, shredded filo layered with soft cheese imported from Turkey, which is baked until golden, then drizzled with honey syrup. The halva with ice cream, a “hot and cold” dish served with pine nuts, also sounds intriguing. While the rice pudding is ready to go, the other two desserts are made to order and require 10 minutes for prep.